I could totally be interested in the Popo casts if they turn out well. Cool. It shouldn't be too hard to make some extra casts. Out of curiosity, what size would you want? I'm trying to shoot for ~4 inches (aka Krillin size) but if you wanted something different it's easier to just make multiple hydroshrinks. I want him in Figuarts scale. I'm not sure how tall that would be, exactly. I'd have to look at references and stuff. 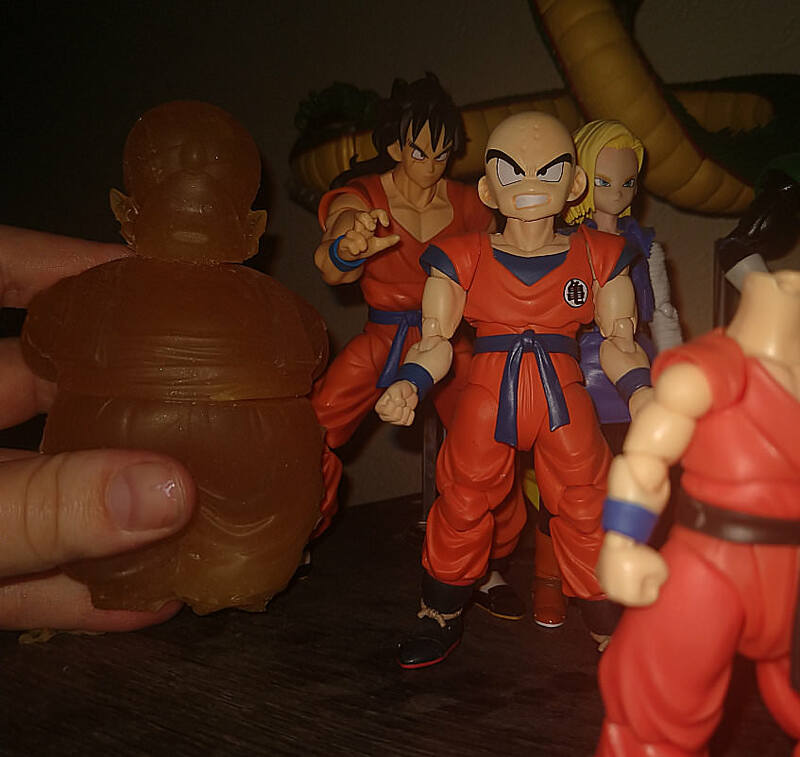 See, that's kind of where I'm at... From what I can tell, he's roughly Krillin height, but what that means changes from scene to scene and even the figuarts fig isn't quite correct. 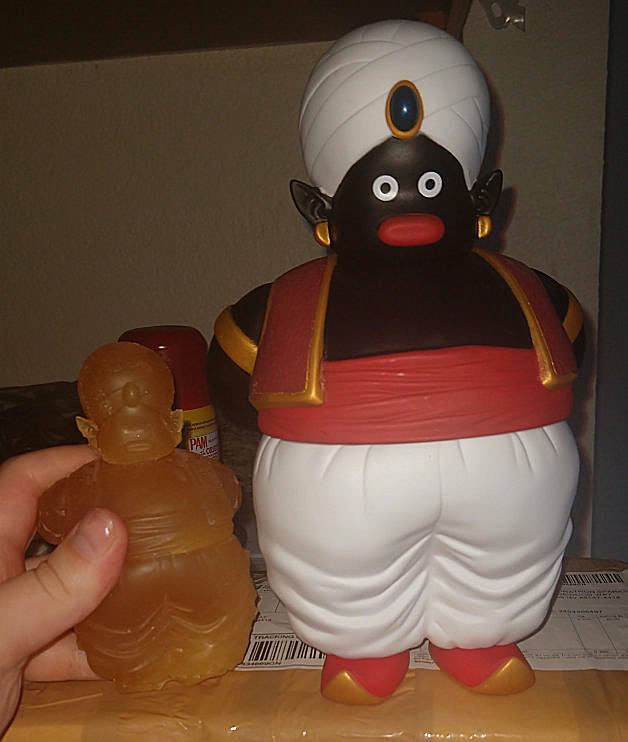 As things stand, the original Popo stands at ~8-9 inches (reports on the Popo conflict and mine is currently covered in oogoo 30) and the optimal hydroshrink ratio is about 1:2, which will end up at 45% of his original height. If he's 9in that's probably fine, especially if I short the water a bit... But if he's closer to 8inch, I may have to risk a 1:1 ratio, which is not recommended but which will supposedly allow a 54% size reduction. It's a moot point ATM tho. I've used 3 full sets plus the remainder of a fourth and I still need at least one more set of oogoo 30 to give me decent coverage. And since they run $25 a pop and I'm about to be charged for Tien... I'm gonna hold off a few weeks before getting an additional set. Really great work here! I, especially, like the Tarble. 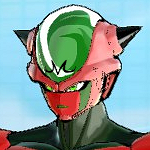 Really ingenious to print out a Xenoverse model for the head. How did you go about doing that? I'd imagine it was a little more complicated than just ripping the model, right? I've always wanted to make some customs of my Xenoverse characters. Just printing the heads would be so convenient! So I don't have the heart to go into the insanity that's been Popo RN, except to say it's taken some turns lately and I want to leave it there. 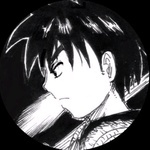 In more recent news, working on fixing the... insanity that is Dragon Stars Cabba. I cut his legs apart at the boot tops and at the end of his shorts, ground off a reasonable amount (not a ton, but enough to make him shorter and less lanky) then filled the gaps with clay. I was going to sand down and just repaint it... but that bulbous head finally annoyed me enough that I purchased a WCF Cabba head. I've also begun work on a custom Bulma (because FU Figuarts I want Buu saga Bulma). I've got some rough plans for how to do it, but RN I'm mostly waiting on a bunch of 3d printed bits I'm going to use for some addons. Good work on Cabba. Do his feet twist? Just want to make sure he isn't so straight-footed, if that's even a term. I may have glued the feet on straighter than they were originally, but I believe there's ball joints there and the hips do rotate. Honestly, as big as that head is, I'm just happy he stands tbh. So this was a whole thing. Ok, so after doing the whole thing with the legs, I got the new head in. 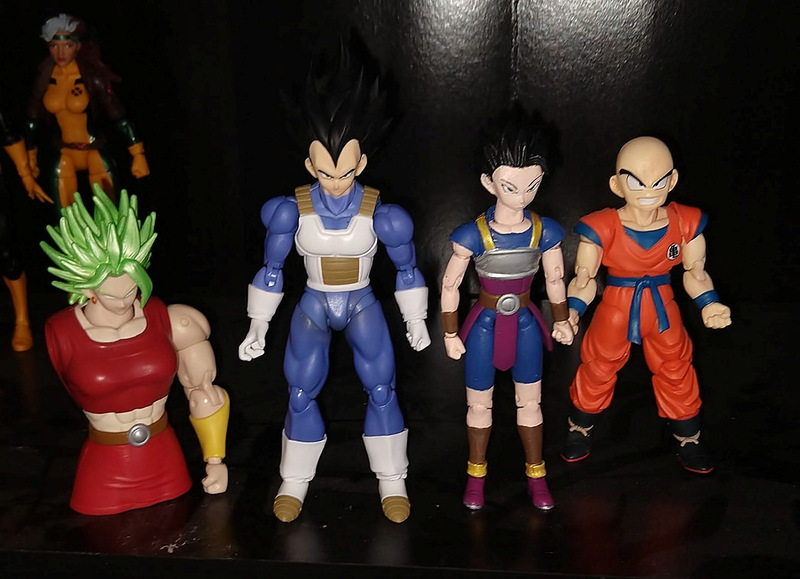 However, for a variety of reasons (mostly due to the better head sculpt) I got the SSJ Cabba WCF figure... which I had to shave the eyebrows off of because Cabba gains 500% more eyebrow in SSJ form then he does in his base form (and I do TRY to keep to Base form for most of my Saiyans). 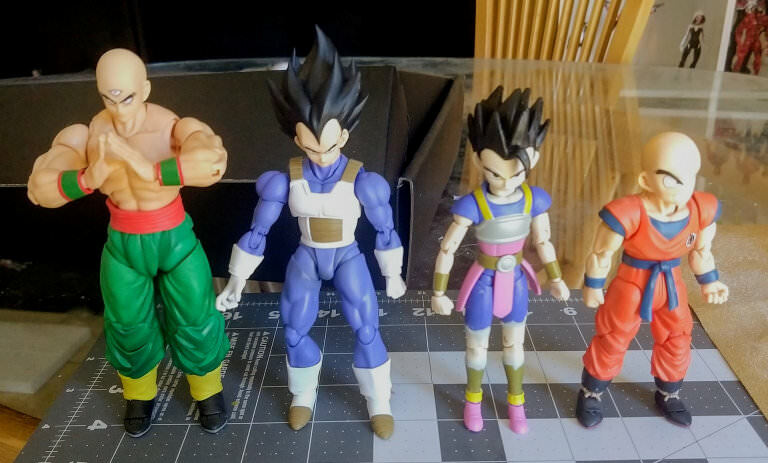 Ended up repainting the entire figure, since the color choices... they're based on him being in his SSJ form to simulate him glowing, but they're just not good. I'm very interested to see how Popo is turning out! Ok, so here's the rundown with Popo... my original attempt at a hydro shrink was a bit too large (and due to how fast the material set the area around the feet was not great.) so I attempted a few more times... and any time I used slightly more water with the hydroshrink, it leaked out of the sides of the mold like kool-aid. I switched gears over to getting a 3d scanner (something I wanted anyway but didn't have an excuse to get) which is great with most items I tested... but the black sections on Popo messed up its ability to properly scan. I was going to then attempt to spray paint the entire thing in a neutral color, but since I rent I needed to do it at a friend's place and it was just a whole frustrating mess. Ultimately I looked at my original attempt this afternoon, decided it was close enough, and have put together a molding box which I just poured a base layer into. In other custom news, I also realized while I was taking photos that I never took photos of the modifications I made to Dragon Stars Hit. 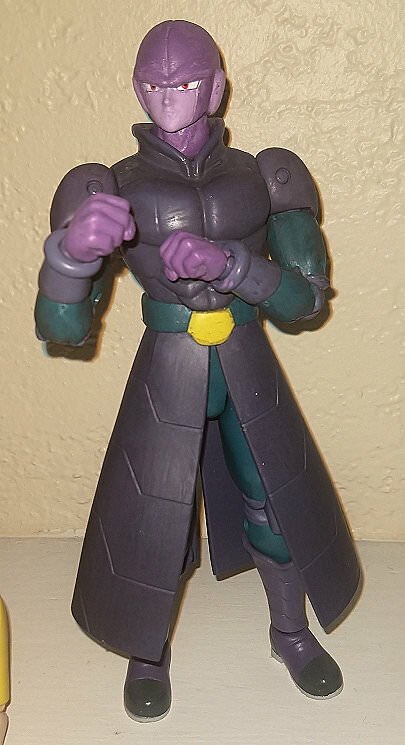 While not as extensive as the ones on Cabba, I did repaint the head and hands, and add a black wash to his clothing (which is more visible on the Teal areas, but I applied it to the rest as well. 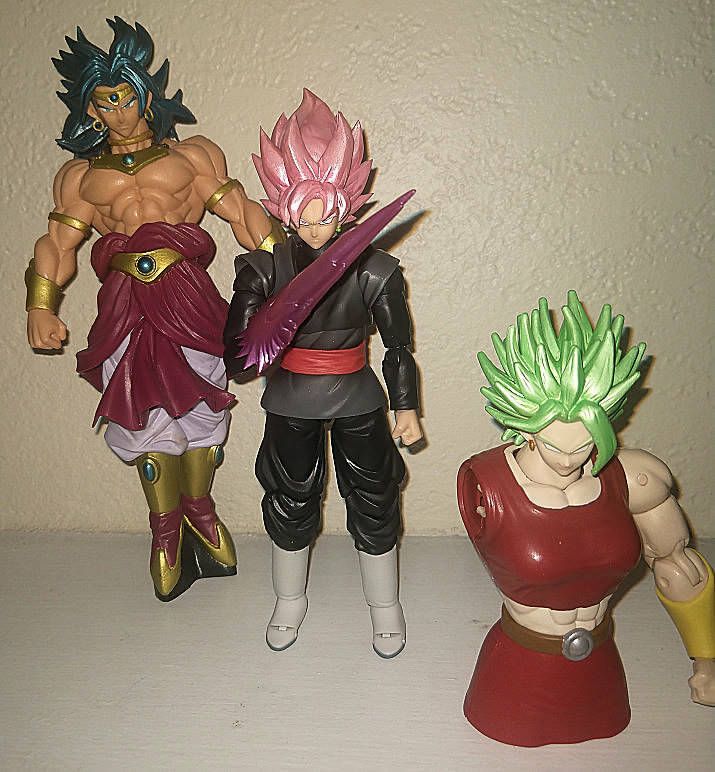 And finally, something I just got done today... a simple but effective change to my Figuarts Goku Black. Some of you may know of my distaste for displaying Saiyan characters in differing transformation (I just like consistency, and guys like Tarble, Nappa, and Raditz don't have canon SSJ forms) but I've made a few more allowances lately for my villains to be in their iconic forms. And while I respect collectors who like a more matte paint job... If I'm gonna have SSJ forms, I like them to be metallic. 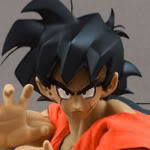 As such, it bothered me that my figuarts Goku Black's hair was matte. and after doing some research I bought a bottle of "Daler-Rowney - FW Pearlescent Liquid Acrylic - Platinum Pink" which turned out amazing. Not only was it the perfect color pretty much right out of the bottle, because it's more of an ink then a paint I realized that while the lighter metallic sheen covered everything, there was a slightly darker pink pigment that simultaneously acted as a wash, seeping into the crevices and details of the hair and complimented the original shading. I put next to no effort into it and it turned out perfect. I like Rose's hair! And Popo turned out pretty well! Just needs feet sculpted, which shouldn't be too hard compared to the rest of his body! So I think you got pretty lucky! So this isn't at all Dragonball related(unless Sakurai does some crazy drugs and puts Goku in Smash Ultimate) but I've been working on it for over a week now and I wanted to show it off. So you know those Trophy cases in Smash 4? Well ever since amiibo became a thing, I wanted to display mine in something similar. And with Smash Ultimate on the way, I decided to finally start on it. Base is wood, put together by a lovely seller on Etsy (on my phone rn, will try to remember to edit this post later) who designed the display to my specifications. There are 68 slots total, allowing a decent part of the Smash Ultimate roster... While allowing me to ignore chunks as well. Whole thing is covered in red felt, with holes cut in, sides of the holes painted red to match the felt(was going to glue felt to the sides but the amiibo wouldn't fit if I did that) and the chunk of felt cut out glued to the bottom to give the amiibo something soft to sit on. Rn I'm over halfway done doing the holes (waiting for paint to dry on the third row before gluing the bottoms down). I wish I had perfected my paint choices earlier, since the bottom row was painted darker than the others (which I thought would hide imperfections but in the end just looks off) and all attempts to repaint it post gluing the felt down just don't cover the old paint very well. That's pretty interesting. Do you have a link to the Etsy seller's work? Since I moved and no longer have my armoire to display my collection in, I wish I had a saw and better skills to build myself some things to display my figures in. I'm super low on money and haven't seen anything on Craigslist that's suitable for what I am wanting to replace. I dunno how great an option this would be in your case, tbh. I spent $97 on the wood portion, and I specifically had the seller leave it untreated and unpainted. That said, I got mine made to hold 68 amiibo, so you might be able to get something a lot more modest of you're not a crazy person like me. Which reminds me, finished work on it this weekend. Also switched my order from alphabetical to based on Smash number. Seems pretty cool. Why did you decide to ultimately go with felt rather than paint or maybe even vinyl? I'm concerned dusting/vacuuming it is going to be difficult. If I had a chop saw and knew more about wood/lumber (specifically, where to get boards made of oak, maple, cherry, instead of just pine... and how to do the work to plane them and varnish/seal them and make them into pretty furniture shelves) I'd totally be making my own shelves to custom fit them to a cabinet. Hell, I'd be making my own cabinet. I've been looking at craigslist off and on and don't see any armoires full of shelves like the one of my mother's I used to have. It's a real shame.